New Shelly plan under construction. 3 bed/3.5 bath home with open media room, loft area and a bonus room upstairs with 2 additional bedrooms and 2 full baths on slab lot. Master on main level, formal dining room and newly designed kitchen that will over look into the Family room. 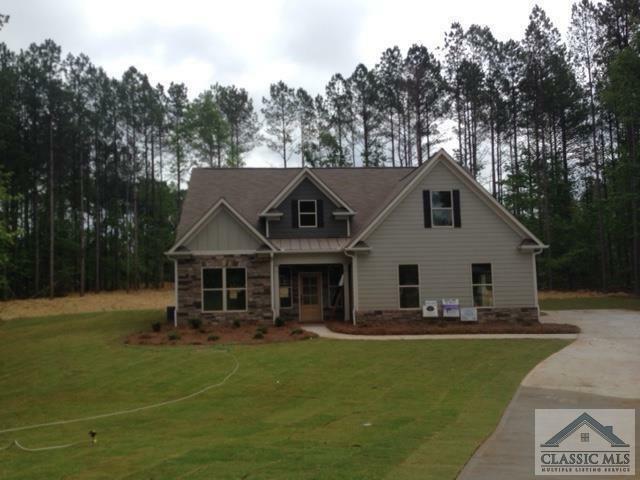 Many upgrades included in this beautiful craftsman style home. Wood floors on all main level except bedroom, bath and laundry rooms. Wide open 2 story foyer as you enter the home passing the separate formal dining room, powder 1/2 bath leading to the open kitchen and family room. Kitchen features double wall ovens, smooth flat top cook top, microwave and dishwasher. Upgraded cabinets with double trash pull out, and drawer base cabinets ILO regular cabinets granite counter tops with tiled back splash. Kitchen Island area overlooks into the family room. Family room with wood burning fireplace. Large master bedroom, with walk in closet, master bath with tiled walk in shower, garden tub with decorative window above. Main level with decorative wall and crown molding. Laundry room off the side entry garage. Upstairs you will find second bedroom 2 with its' own bath, a loft area to accommodate a computer station plus an open media/theater room. A second full bath, bedroom # 3 and a huge bonus room as well. Wood flooring in upstairs hallways, loft and media room. Tile floors in all bathrooms and laundry. Granite counters in all bathrooms and kitchen. upgraded bronze fixtures and hardware. Home is on a large 1 acre lot, Walk across the street to Bear Creek Reservoir to picnic and fish or walk back to the back of the subdivision to the HOA owned 10 acre green space surrounded by the Middle Oconee River to see the wild life and canoe or kayak.Pictures are not of actual home. Home is in early stage of construction. Riverbend At Bear Creek is a subdivision within the city of Bogart, Georgia. There are currently 9 Homes for Sale within Riverbend At Bear Creek, with asking prices ranging from $60,000 to $384,900. The average list price per square foot of the available inventory in Riverbend At Bear Creek is $170, which is below the Bogart average of $242. The Average Sales price of all sold real estate in this subdivision for the past year is $307,661. Recent comparable homes have been selling for 98.17% of their asking price. Waterfront homes represent 0.00% of the available Riverbend At Bear Creek inventory. The population of Bogart, according to the 2010 Census, is 1,034. The total number of households in the zip code of Riverbend At Bear Creek is 4,042, with an average household size for of 2.56 people. The total number of renter households within the zip code of 30622 is 1,229, which means that 69.59% of households in this zipcode are owner occupant households. 184 Rapids Drive, Bogart GA 30622 is a Home, with 3 bedrooms which is recently sold, it has 2,602 sqft, 1+ - 2 sized lot, and Attached,Garage,Other-See Remarks parking. A comparable Home, has 4 bedrooms and 3 baths, it was built in and is located at 760 Rapids Dr #34A Bogart GA 30622 and for sale by its owner at $ 354,900. This home is located in the city of Bogart , in zip code 30622, this Jackson County Home, it is in the Riverbend At Bear Creek Subdivision, and Bear Creek Plantation are nearby neighborhoods.